Blue / Red / Orange / White Spectrum. Perfect for use in hydroponics or any other growing methods! BRAND NEW, HIGH QUALITY item! 4pcs HQRP Plant Grow Panel Lamp System is the perfect tool in growing plants to maximum health and full potential. This LED light technology has been scientifically proven as a crucial tool in providing plants with essential elements and enhancing the photosynthesis process. The combinations of Red, Blue, Orange and White LED lights have been formulated to provide a beneficially synchronized effect on the plant. The Blue LED lights (465 nanometers) provide peak chlorophyll absorption in the plant, promoting vegetative growth. The Red and Orange LED lights (610-640 nanometers) cause large absorption of nutrients by chlorophyll, most critically influencing the photosynthesis process, which in turn promotes budding and flowering. White LED lights (7000K) are usefull for your plants to absorb other lighting spectrums as supplementary like natural sunlight. Please, pay attention that we make all the best to provide the highest level of service to our customers. High quality , reasonable price for all the goods we offer. HQRP® LED Plant Grow Panel. 225 LED's; 77 Red LED lights (640 nm wavelength) + 47 Blue LED lights (465 nm wavelength) + 77 Orange LED lights (610 nm wavelength) + 24 White LED lights. Material/Dimensions: Thermoplastic body, Die-cast Chrome Circuitry board; 12.2" (31.0 cm) square panel: 1.25" (3.175 cm) thickness. Electrical Consumption: 14 Watt Power. Working Voltage: 110V to 220V. 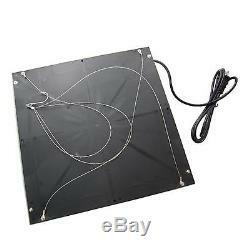 This kit includes 4 HQRP Plant Grow Light Panels. Each panel is connected separately to a power outlet and is controlled separately. The HQRP Plant Grow Panel Lamp System is made up of 225 bright Red, Blue, Orange and White LED lights at 14 Watts. These Die-cast Chrome LED''s are enclosed in a sleek yet durable thermoplastic body built to last. This product is a must have for any garden, amateur or professional, and is perfect for use in hydroponics or any other growing methods. Please, check our complete terms and policies using the following Link below. Sorry USA Continental only (No AK / HI / PR, APO or FPO). Unfortunately, we do not send goods to Malta, Denmark, Russia, India, Africa. Malheureusement, nous ne livrons pas nos produits à Malte, Danemark, Russie, Inde, Afrique. Leider wir nicht Waren nach Malta, Dänemark, Russland, Indien, Afrika senden. S'il vous plaît, demandez le prix de livraison avant d'enchérir. Bitte, fragen Sie die Versandkosten vor dem Kauf. It takes approximately 5-14 days for items to be delivered to specified countries. For some countries like Australia, New Zealand and South Korea additional 3-5 days may be needed for items to be delivered. Hotels, motels, resorts and inns. Our companys working hours are: 10:00am-05:00pm EST, Monday -Friday. We'll answer your letter during these working hours. We do not disclose private information of our customers to third parties except when obliged by law or court order. 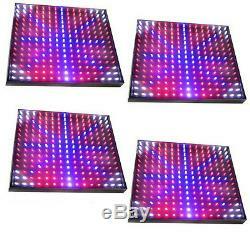 The item "Four Grow Light Panel 56W QUAD-BAND 900 LEDs for Green house, Hydroponic System" is in sale since Friday, April 10, 2015. This item is in the category "Home & Garden\Yard, Garden & Outdoor Living\Gardening Supplies\Hydroponics & Seed Starting\Other Hydroponics". The seller is "lighthouse-usa" and is located in Harrison, New Jersey.